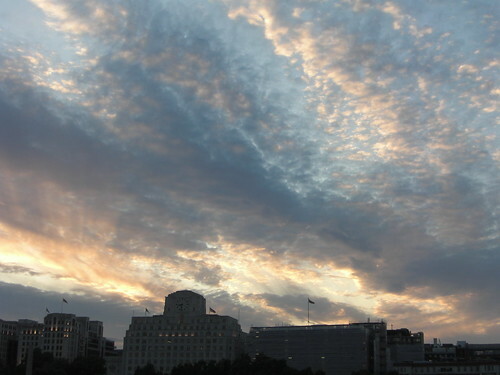 Southbank, one of the best places in London to wander. Packed to the brim with a great diversity of people, I don't believe that there is a nicer place to be on a balmy and bright summer's evening. Dotted all the way down at intermittent intervals are places to eat of various shapes and sizes. From chains to upper end dining, you can find them all within spitting distance of each other. Having already visited the Skylon Grill on a previous visit, I decided to try out Benugo Bar and Kitchen within the confines of the BFI. I was meeting the curiously named Mountain Goat. This particular breed threw in his well paid job at very well know company (forgoing free food, and probably more importantly, free cake) to climb mountains for a living. As far as I am aware, he hasn't been classified insane. Yet. Anyway, we met, we chatted and we scampered around a bit looking for this well hidden place, which incidentally is actually located slap bang inside the BFI. Benugo Bar and Kitchen is an offshoot of the Benugo clan of coffee and sandwich shops. On entering this lofty space, this place clearly had no intentions of being a coffee bar, with furnishings closer to that of an upmarket All Bar one and a rather resplendent bar situated at the back. We headed over to the restaurant on the right hand side of the room and were given our menu's. So far so good. 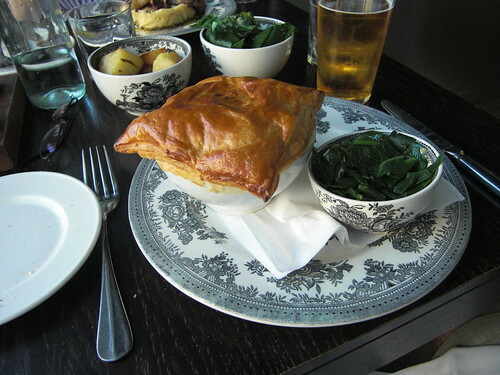 Benugo B&K prides itself on its British classics and the food appears firmly routed within these loose restrictions. 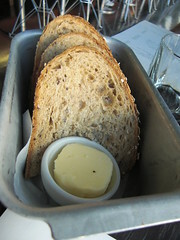 I decided to order a Watermelon Martini (start as you mean to go on) as some above average bread was brought over, accompanied by some rather bland butter. 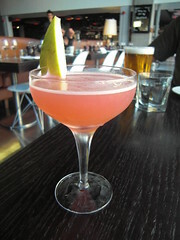 The martini was crisp and reassuringly strong, although the overall taste of watermelon was somewhat lacking. 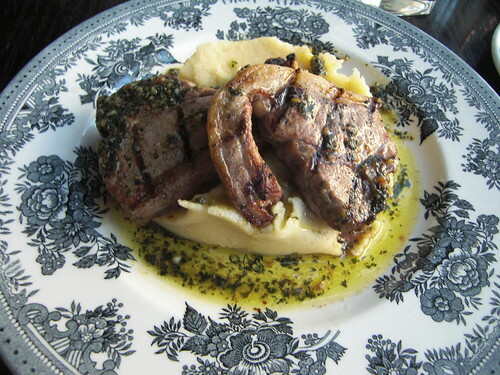 For me, I ordered the lamb chops with garlic mash and mint pesto. The lamb chops were very nicely cooked, with the pre-requisite grill lines. It must have hit the grill at quite some temperature as the fat had begun to crisp up whilst to middle remained pink and moist. The mash was ok, not that much garlic flavour really coming through, and I never seem to understand why so much mash is normally piled on the plate. If its really rich, you don't need the mounds of starchiness, although if it was that rich, you would probably polish it off anyway and make you feel ill. Lastly, and probably the most confusing for me, was the mint pesto. It really didn't have that much of a mint kick, but the dominating flavour was the cheese (parmesan I assume), used in the making of the pesto. A rather more restrained use of said cheese would really have helped the dish along, instead, it totally dominated all the flavours. The goat went for the Chicken, ham and mushroom pie, with the only proviso being that I was allowed a taste. My mouthful was a little strange, dominated by something sweet. I wasn't sure where this sweetness was coming from, but the mountain goat assured me that my taste buds were playing tricks on me as he silently but stealthily devoured his pie. Benugo B&K is a good value but ultimately average restaurant. I think the cooking is above average but the flavourings of the dishes definitely need work, judging on this experience. Prices are competitive with mains starting under a tenner and not more than £15. Once the bill was settled, awaiting the final musketeer, we toddled off in search of beer surveying a frankly startling London skyline. 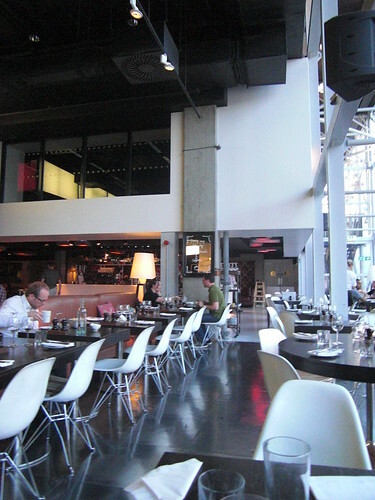 I particularly like Blueprint Cafe on the Southbank, they serve lovely food and it has nice views too.